일명 ‘신비의 바닷길’로 불리는데, 조수간만의 차로 바닷물이 빠져나가면서 마치 바다가 갈라지는 것처럼 보이는 것이다. 바닷길은 길이가 2.8㎞, 폭 10∼40m이며 지형적 요인과 함께 달과 태양의 위치가 1년중 지구에 가장 강한 인력을 미칠 때 일어나는 현상이다. 해류의 영향으로 바다 밑의 모래층이 발달해 바닷물이 빠질 때는 큰 차가 다닐만큼 단단하다. 약 1시간동안 계속되는 이 바다갈림 현상은 1975년 주한 프랑스 대사인 피에르 랑디가 진도개의 상태를 보러 왔다가 이를 보고 ‘한국판 모세의 기적’이라고 프랑스 신문에 소개한 뒤 세계적인 화제가 되기도 하였다. 진도 주민들은 바닷길이 가장 크게 열리는 봄(2∼4월)과 가을(9∼10월)에 마을의 수호신인 뽕할머니와 용왕에게 어업과 농사의 풍년을 비는 영등제를 함께 지낸다. 우리나라에서 바다갈림 현상을 볼 수 있는 곳으로 충남 보령 무창포를 비롯해 전국에 약 20여 곳이 있는데, 그 중 진도의 바닷길이 규모가 가장 크다. Popularly called the “Miracle Sea Route” among Koreans, this place looks as though the sea has parted to create a road during ebb tides. The road, which is 2.8 kilometers long and 10-40 meters wide, emerges from the sea when the gravity of the positon of the moon is at its peak. As the layer of sand has been hardened by the ocean current, even very large vehicles can safely cross this road during ebb tides. 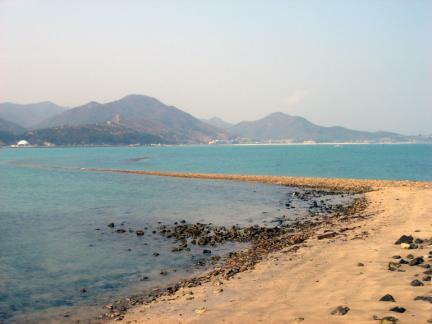 Although the road is open for no more than an hour at each ebb tide, it has become a very popular place among tourists from other countries, especially since a French ambassador named Pierre Landi, who came to observe the condition of Jindo dogs, wrote an article in a French newspaper describing it as the “Korean Miracle of Moses.” The residents of Jindo Island celebrate a traditional festival called Yeongdeungje, during which they pray to the guardian spirits of the village, Grandmother Ppong and the Dragon King, for a good harvest. 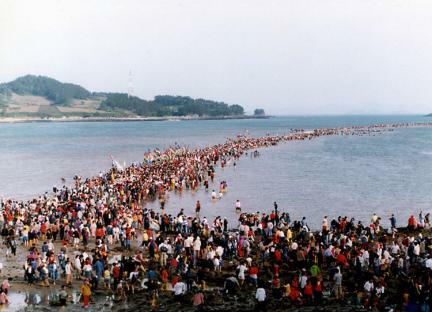 The festival is usually held in spring (February-April) and fall (September-October) when the sea road is at its widest. 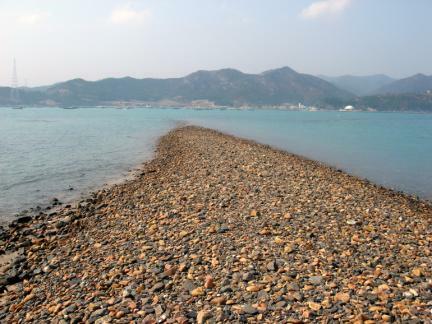 There are about twenty sea roads in South Korea including Muchangpo Beach, Boryeong, Chungcheongnam-do. 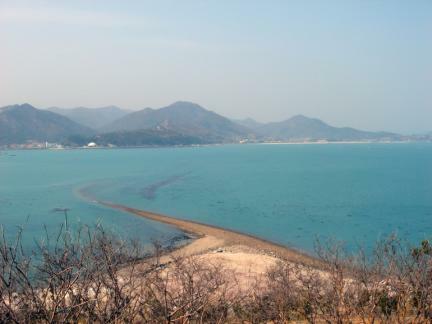 However, the Sea Road of Jindo Island is the largest and most popular of them all.